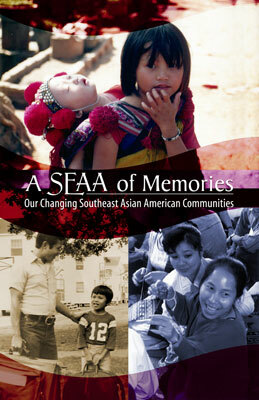 The Libraries’ spring exhibit, A SEAA of Memories: Our Changing Southeast Asian American Communities, celebrated the completion of two major grant projects which have enabled the Libraries to make the unique archival collections in our Southeast Asian Archive available for study and research for the first time. The archive was established in 1987 to document the experiences of refugees and immigrants from Cambodia, Laos, and Vietnam who resettled in the United States after the end of the Vietnam War in 1975. A SEAA of Memories showcases items revealing many aspects of the refugee experience including humanitarian efforts in Asian camps, cultural activities in the San Francisco Bay Area, household items that were abandoned on arrival in the U.S., and advocacy efforts on behalf of Southeast Asian American communities. Linda Trinh Vo, associate professor of Asian American studies, served as faculty advisor on the grant and gave a talk at the opening event. Vo received her Ph.D. in sociology from UC San Diego, and is the author of Mobilizing an Asian American Community. She is an expert on the social, political and economic challenges faced by Vietnamese refugees and immigrants.